Discussion in 'MOC 2019 Challenges' started by keepscrappin, Jan 24, 2019. Hey, hey scrappers! Your challenge today, should you chose to accept is to use a photo as your background. Normally, a paper is used as the background layer, but today you are going to use a BIG photo as your background. So instead of checking your stash for a background paper, you're going to check your photo file! 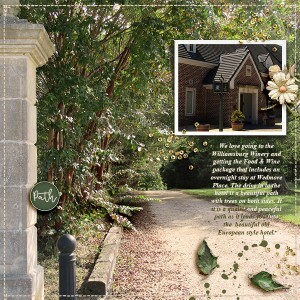 Once you have your photo background, you'll add elements and papers on it, just like a standard layout. Don't overthink this challenge, keep it simple. Just use a photo as your background and make your layout on top of it. The easiest way to do this is to use a BIG photo with some room around your subject instead of a paper as your background layer. Leaving room around your subject will give you space to add additional elements. If in doubt, look at my examples and make your layout similar to mine. Note that the background photo fills the entire layout and is visible on all edges of the layout. And here are some other examples that meet the requirements of this challenge. Use ONE single BIG photo as your background. You may add more photos to your layout, but the background of your layout must be one photo. Note: The background is the bottom layer in your layout. The background photo MUST FILL THE ENTIRE BACKGROUND LAYER and BE VISIBLE ON ALL EDGES of your layout. The background photo must be used as a basic standard photo, meaning you CANNOT BLEND your BIG photo with a paper or another photo. Finish your page by adding other TLP product. You wouldn't do a page with just a background paper and a title, so you need to add additional product over your photo (following the MOC 75% rule). Your layout CANNOT just have a BIG photo and a font title. crazsquaw, Ferdy, Karen and 10 others like this. Saving this spot for Questions and Answers. Your background MUST BE PROMINENT in your layout, so I can clearly see you used a photo as your ENTIRE background. Q: Does it have to be full strength or can we "dilute" it? A: Good question, it MUST be full strength like a standard photo - NO BLENDING or LOWERING OPACITY of the background photo. See my examples. They are full opacity. Think of it like in paper scrapping where you would have a BIG photo printed and then you would use that photo as the base (background) to build your layout on. Q: I get what you mean by not blended and full opacity. Can it be black and white or sepia? A: Yes, it can be a standard black and white or sepia photo. A: No paper borders around the edges of the photo, the photo MUST go to the outside edges of your layout. However, you are allowed to make a border on top of the photo a little inside of the edges. Like the stitching on this layout by @cfile Christa. Q: I hope it's permissible for me to have used some grunge in one corner? A: Yes, this is permissible as long as I can see that the photo is the ENTIRE background AND the bottom layer of your layout with the grunge painted on top. Does it have to be full strength or can we "dilute" it? And yet another fabulous challenge!!! But----off to bed for now and looking forward to playing with this in the morning. Good question, it MUST be full strength like a standard photo. See my examples. They are full opacity. I love big photo pages! Another great challenge! Thanks, Kayla! Lisa B, patsyt, wvsandy and 4 others like this. Ok scrappers. It's past my bedtime here, so I'm heading to bed. I'll check in first thing in the morning. When in doubt, look at my examples and follow my lead. Don't overthink it and just enjoy scrappin! Doramiyi, heathert, Oldenmeade and 21 others like this. Doramiyi, Lisa B, julianz and 11 others like this. What a great challenge, Kayla! I'm loving all of the wonderful pages so far. Easy challenge for me, but I enjoyed it. Thanks for the great idea. Miss Becki..., wvsandy, keepscrappin and 2 others like this. Buffini, keepscrappin, wvsandy and 1 other person like this. keepscrappin, wvsandy, threadjungle and 2 others like this. Lisa B, Miss Becki..., SeattleSheri and 5 others like this. It's a miracle I did a challenge on the day of a challenge! Thanks so much for the challenge @keepscrappin! Doramiyi, Aerobigirl, Miss Becki... and 14 others like this. keepscrappin, wvsandy and threadjungle like this. Doramiyi, patsyt, keepscrappin and 3 others like this. Thanks for the challenge, photo challenges are my favorites! keepscrappin, wvsandy, threadjungle and 1 other person like this.